The Clover Club is a great cocktail. It apparently was one of the classics from before prohibition, but it didn’t survive beyond it very well. In 1934, Esquire magazine called it a drink “for pansies.” That said, it is still found in all three of my 1930s cocktail books. People may have sneered at it, but it managed to hang in there. Everyone today assumes that it was the pink color that just couldn’t be handled by real men. At any rate it’s making a bit of a comeback now, and it really is a lovely drink in the sour family. In the 1930 recipes, and today, grenadine is the tricky little “pinker” ingredient, but pre-prohibition it would also have raspberry syrup in place of the grenadine. Our friend Axel notes on his recipe that you can also use Créme de Rose (a rose liqueur) in its place as well. Basically you just need a little bit of something red and sweet to give a gin sour a little kick to make it into a Clover Club instead. It is interesting to see the Lommebogen recipe use dry vermouth as well, as I’ve not seen that anywhere else, but it works surprisingly well. This is the second recipe so far with eggs in it, and it won’t be the last, so I feel I should pause a moment. I find this totally normal these days, but I know it gives pause to many. I love egg white cocktails. I was first introduced to them by a roommate in Scotland who was a big cocktail enthusiast. They don’t change the flavor of drink but add an amazing foamy, silky texture. Most people envision raw, gloopy egg white in their drink, but they are whipped up in the shaking process and turn into something wonderful. Instead of thinking of goopy raw egg, you should think of whipped egg whites for something like a meringue. I also find the classic flips and eggnogs a delight as well. These tend to use whole eggs, and overall the eggs just add a richness and texture you wouldn’t otherwise have. I normally use the packaged, pasteurized egg whites for my cocktails. It’s mostly because I hate wasting an egg yolk, and I don’t have an immediate use for all the yolks I’d produce. Most cocktails I make regularly use just the whites. In addition to finding them convenient, it’s also a bonus for people who get squeamish about having a raw egg, after years of egg salmonella scares. (You can find too many arguments on both sides of the aisle to make any real informed decision, but I side with raw egg being OK.) The packaged egg whites work just fine, but I do find that using a regular egg does seem to give better foam. I use regular eggs if I have a use for egg yolks handy, such as another cocktail that uses yolks, like the Coffee cocktail (coming up soon), or I have a custard or Hollandaise sauce on the agenda. The Lommebogen recipe is tasty. It’s more balanced than I expected actually, though still a little on the sweet side, as I’m generally finding the Lommebogen recipes. 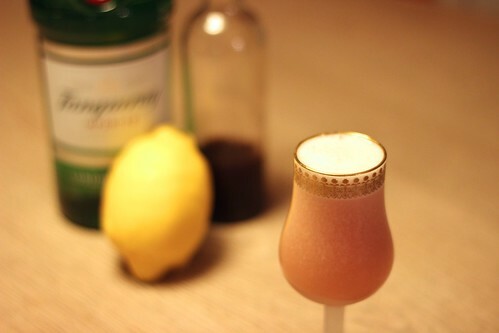 A quarter to half ounce of lemon juice would probably be good, but the vermouth helps to cut the grenadine in place of the lemon juice in other recipes. The Cafe Royal recipe was tart, just as I expected it to be from the recipe. The Savoy, on the other hand, was just right for me. This is another of those sweet/sour balance recipes that’s going to vary person to person at the end of the day. As rule, I’d make the Savoy for me, and the Lommebogen for most other people.